Membrane lipids are amphipathic, which means that they have a polar or hydrophilic end and a non-polar or hydrophobic end. In aqueous mediums, membrane lipids spontaneously organize into bilayers with the polar ends oriented towards, and the non-polar ends oriented away from, the solution. The bilayer closes in on itself to avoid free edges with water. These basic structural properties of plasma membranes enable them to carry out their fundamental functions. For example, the propensity of membrane lipids to form a thermodynamically stable, closed lipid bilayer structures renders them stability and encourages the formation of closed subcellular compartments. 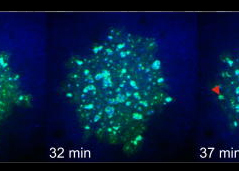 It also enables the spontaneous repair of small tears in the membrane, which prevents material leaking out of the cell or organelles. Furthermore, the hydrophobic interior of membranes serves as a barrier to water soluble molecules but allows certain lipid soluble molecules to passively diffuse through. Membranes are therefore selectively permeable structures; a property that helps to prevent leakage and protect the cell from the passive entry of many toxins. Phosphoglycerides have a hydrophilic polar head and a hydrophobic fatty acid tail. The composition and length of the hydrocarbon tail is somewhat diverse and is reported to range from 14 carbons to 24 carbons. Chemical modification to the inositol ring occurs in the conversion of phosphatidylinositol to other phosphoinositides. Membrane lipids are highly diverse, with a typical membrane containing more than 100 species of lipids. These lipids vary in their structure and extent of saturation of the fatty acyl chains. 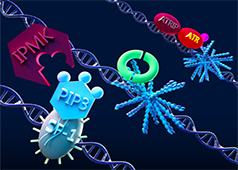 There are three major classes of membrane lipids – the phosphoglycerides, sphingolipids and sterols. The phosphoglycerides and sphingolipids can be combined as one class, the phospholipids. These are the classical membrane lipid, formed of a polar head group and two hydrophobic fatty acid tails. The fatty acid tails typically contain between 14-24 carbon atoms. One of the two tails is unsaturated and therefore contains one or more cis-double bonds, which creates a small kink in the tail. The other tail is saturated, without any cis-double bonds and remains straight. 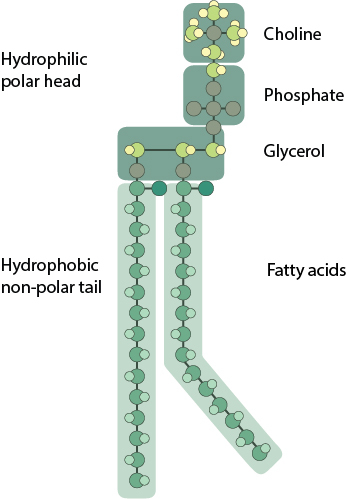 Variations in the length and saturation of the fatty acid tail affect how tightly phospholipids are able to pack against each other, leading to altered membrane fluidity. Linking the polar head group to the fatty acid tail is a backbone made up of either glycerol or sphingosine. The different backbone molecule differentiates between the classes of phospholipid. How are phosphoglycerides structurally and biochemically different from sphingolipids? Phosphoglycerides have a polar head group esterified to one of three glycerol hydroxyl groups, and two hydrophobic fatty acid tails esterified to the remaining two hydroxyl groups of the glycerol backbone. The polar head group is composed of a phosphate group linked to choline, ethanolamine, serine or inositol. These form phosphatidyl choline (PC), phosphatidyl ethanolamine (PE), phosphatidyl serine (PS) and phosphatidylinositol (PI) respectively. Sphingolipids, on the other hand, have a backbone formed from sphingosine, an amino alcohol with a long hydrocarbon chain; a less abundant class of membrane lipids. Ceramide is a simple sphingolipid which has a hydrophobic fatty acid tail linked to the amino group of the sphingosine. The esterification of additional groups to the terminal hydroxyl group of the sphingosine backbone gives rise to other types of sphingolipids. For instance, sphingomyelin has a polar phosphoryl choline head group and glycolipids have a carbohydrate group. The carbohydrate group of glycolipids can be a simple sugar or an oligosaccharide forming cerebrosides and gangliosides respectively. Sterols are smaller than phospholipids. They have a single polar hydroxyl head group attached to a rigid steroid ring structure and a short non-polar hydrocarbon tail. Cholesterol is the major sterol component of animal cell membranes. Different sterols are found in other eukaryotic cell membranes. Yeast and fungi use ergosterol, while plants use sitosterol and stigmasterol. However, prokaryotic cell membranes essentially contain no sterols. Sterols insert into the lipid bilayer with their hydroxyl head groups oriented with the phospholipid polar groups. This aligns the rigid ring structure of the sterol with the phospholipid hydrocarbon tail, which decreases phospholipid mobility. This stiffening effect also reduces the water-soluble permeability of the bilayer but does not affect membrane fluidity.